The Saronic islands, to the South West of Athens, offer a leisure sailing, protected from the strong winds. Aegina, Angistri, Poros, Hydra and Spetses are ideal for one week charters or two weeks relaxing sailing, offering to the sailor sandy beaches and safe anchorages in picturesque little bays, in spite their proximity to Athens. 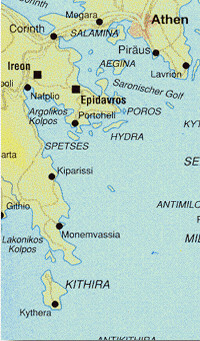 Further south the eastern coast of Peloponnese, starting from Epidaurus, with the famous ancient theatre, to Nafplion, Leonidion, Kiparissi, Yerakas and finally Monemvasia, with its imposing Byzantine ruins, offer to the sailor the combination of a relaxing sailing and a sight seeing as well. Suggested itinerary for one-week charter: Alimos, Poros, Spetses, Portohelli, Hydra, Aegina, Alimos, or Alimos, Korfos, Epidavros, Poros, Hydra, Aegina, Alimos. Suggested itinerary for two-week charter: Alimos, Poros, Dokos, Spetses, Leonidion, Kiparissi, Monemvassia, Elafonissos, Gerakas, Portohelli, Hydra, Aegina, Alimos.